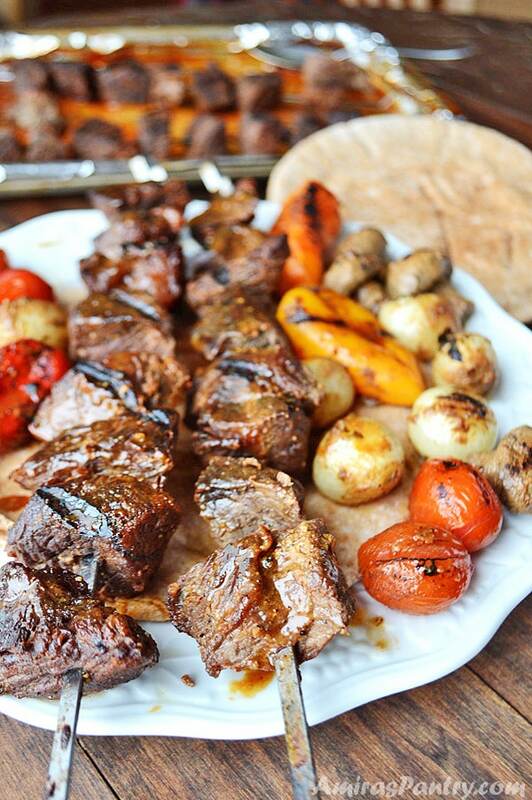 Shish Kabob with the best beef shish kabob marinade. This Middle Eastern beef kebab recipe has been in the family for so long, I’ve made it several times and I never failed to impress. Shish Kabob, skewers of beef and vegetables, are the most interesting grilled meat recipe for my family, and many others. Although it is easy to make, it needs to be done just right. 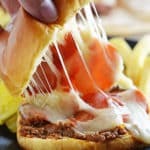 Here is a foolproof recipe with tips and step-by-step tutorial to get perfectly cooked vegetables and meat every time. 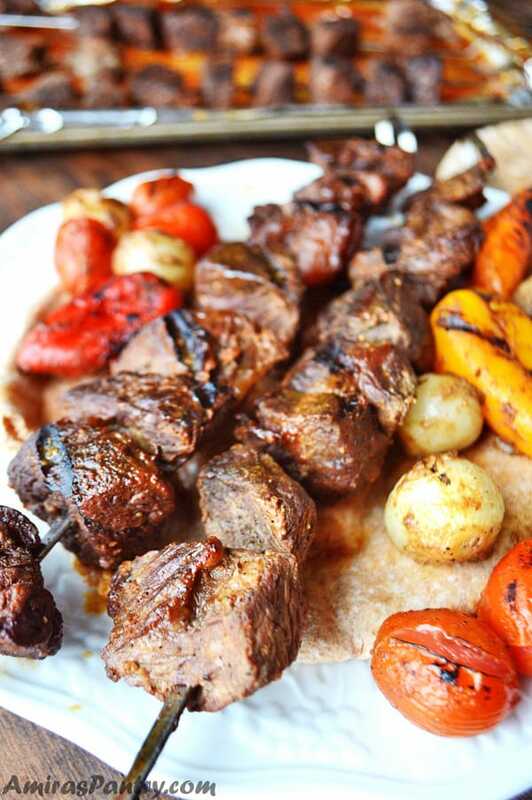 Shish kabob/kebab has been in the Middle East since ages, chunks of beef and veggie skewers that are usually cooked over a charcoal grill and served over a bed of rice or with pita bread, so delicious and eye catching. Summer is all about grilling, right? 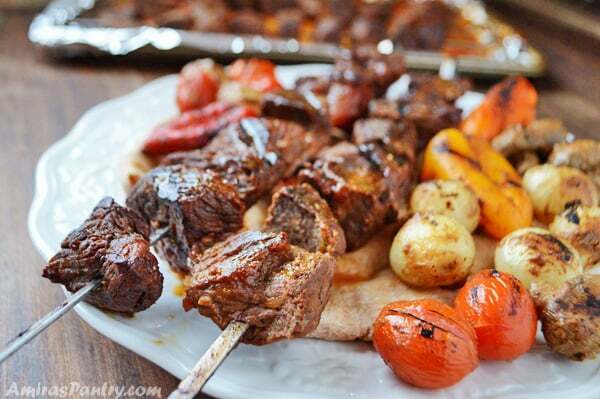 keep burgers and hot dogs in the freezer for now and let’s try some beef shish kabobs. We always end up with flavored, well balanced and tender beef skewers. The acidity in the marinade helps tenderize the meat perfectly. I’ve prepared this on the grill and sometimes in the oven when it is snowing or raining out there, it is good either ways. Sometimes, when I have time, I also use the coal trick I showed you before while making the Libyan Merayesha and it gives it the sweet smell of grilling on a charcoal grill. What kind of meat do you use for shish kabobs? I used to be a fan of the tenderloin cuts. It works great but the price is high, so if there is no deal on them, I leave it there. Now I mostly use steak tips, it is not as pricey as the tenderloin, more beefy and I can find it already cut. Kabobs are usually served with a plethora of dips and spreads along with Basmati rice. Tahini, baba ganoush and hummus are the most common to serve with kebabs in Egypt. How do you cook shish kabob? Usually shish kabob is grilled in an outdoor grill. for oven, it is suggested that you broil the skewers for 4-5 minutes on high turning them once to the other side. For oven instructions please see the recipe below. I highly advice you to do so. Two hours in the marinade is sufficient to achieve some flavor.But good 8 hours are best for the marinade to sink in. Marinating for 12 hour is even better. Do use fresh garlic in this recipe: it really makes a huge difference and do not ever use powder garlic. Do not be afraid of using yogurt: and let it marinate all this time, it is really very good. Do use a good olive oil if possible: I’ve tried it before with vegetable oil and I could taste a big difference. Oil is used as a flavor facilitator as the herbs used release their flavors best in oil. Do prepare ahead of time : I like to marinade my beef for at least 8 hours, but sometimes I can get away with 4. The longer the better in my opinion. Do not add salt : This recipe calls for a big amount of soy sauce, so really no need for salt. 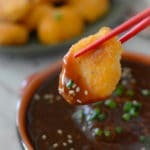 Use soy sauce as a flavor enhancer for more complex flavor. Do marinade veggies in a different bag : and put them on different skewers as cooking time is drastically different between veggies and meat, even between different kinds of veggies. In a zip lock bag, add the marinade ingredients and mix well. Take some of the marinade and put in a container, refrigerate. Add cubed meat to the bag and mix everything well together. Refrigerate for at least 2 hours and up to 12 hour. Take out the container that we reserved earlier, and pour it in another zip lock bag. Add veggies and marinate for 30 minutes to one hour. When ready to grill, thread meat in skewers then grill as directed below. My boys would devour this in no time at all, When they see skewers they know they are in for a treat and I know I would not have hard time convincing them to eat. They eat anything on a skewers.. seriously ANYTHING. There is something magical and luring about food on a skewers, and I use this fully to my benefit. 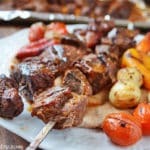 I like using metal skewers for my shish kabob they help in cooking the chunks of meat better. 2/3 cup oil- preferably olive oil. 3 garlic cloves – minced. 2 teaspoon freshly ground black peppers – or to your liking. Sweet bell peppers or bell peppers cut into chunks. 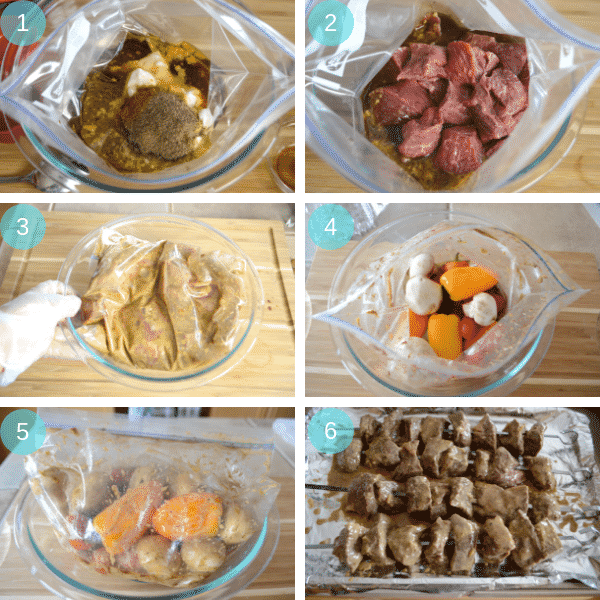 Mix all the marinade ingredients together in a zip lock bag, take 1/2 to 3/4 cup of the marinade and set aside. Add the cubed meat to the bag and coat well. Squeeze out excess air, and seal the bag then marinate in the refrigerator overnight. Add the veggies to the other bag with 1/2 to 3/4 of the marinade and set aside for an hour. Do the same with the veggies as well. Note1: Just wanted to mention that one of the readers complained that the marinade was very acidic for them, so I suggest cutting back the lime and vinegar by half and test the marinade yourself, if you feel it is not tangy enough then add the rest of the lime and vinegar. I’ve tested this recipe in several occasions and never got any problem with it. Note2: To cook in the oven, place two oven racks one in the middle and one near the top turn your broiler on high and broil meat skewers 3 minutes on each side. Please use metal skewers as bamboo might catch fire. Turn oven on 400F, Place the skewers on the middle of the oven and cook to desired doneness. With my oven I have notied the following times : 8 minutes for medium rare, 13 for medium, 18 minutes for medium well and 28-35 minutes for well done. Make sure to re-arrange the skewers once in the middle of cooking so all the skewers be cooked the same. 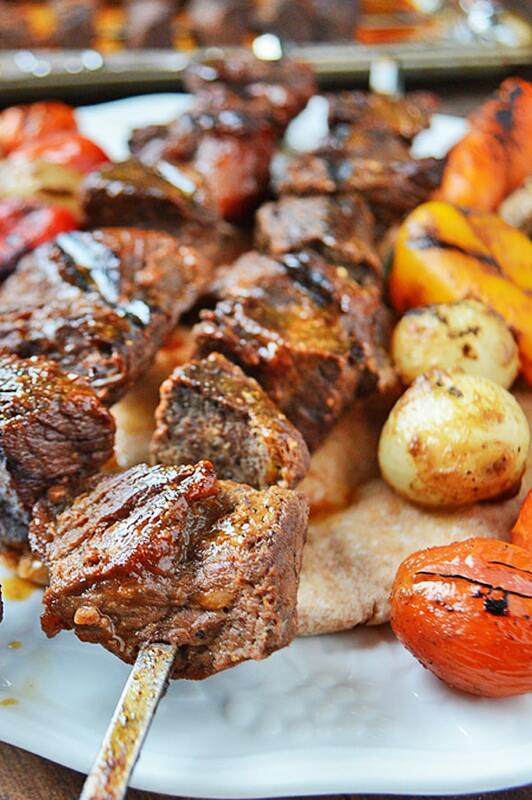 Nutrition facts calculated on meat skewers only without the veggies. 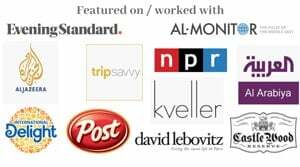 Wow, what excellent stuff! The marinade looks terrific — thanks. Thanks John, I hope you’ll try it. 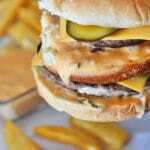 I loved this recipe, I give it a 4 only because I did not use vinegar at all only used the full amount of lemon juice.I cooked mine in the oven per the instructions given to medium and they were perfect. DO NOT USE GREEK YOGURT, I did that once and it did not turn as well as the regular plain one. This is the third time I make these and we all liked them, thank you so much for the recipe. Elizabeth, thank you so much for your reply and for rating the recipe. I am happy you liked it. You’ve added valuable notes that I am sure many others will find helpful. I was thinking of using the kabob marinade for some ribeye steaks. What do you think? Tony, thank you for your interest in this recipe. I used to make my kebabs with this meat cut, just cut it to 1-2 inch cubes. Nowadays I am more fond of using steak tips, I can find it easily already cut into cubes. Thank you Kit for trying this recipe and rating it. I am so glad you liked it. The marinade was great! Really liked it. Thank you, Happy you loved that one.